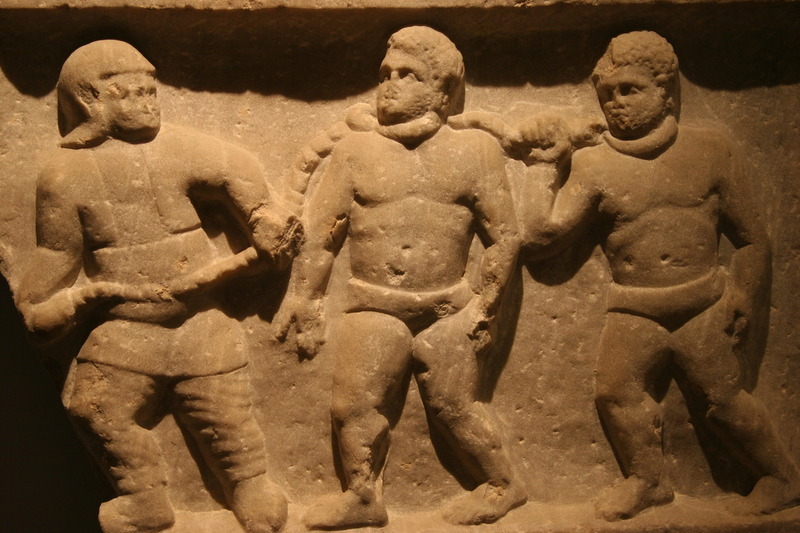 Roman collared slaves, marble relief, Smyrna (present day Izmir, Turkey), 200 A.D., courtesy of the Ashmolean Museum. Various forms of slavery, servitude, or coerced human labor existed throughout the world before the development of the trans-Atlantic slave trade in the sixteenth century. As historian David Eltis explains, “almost all peoples have been both slaves and slaveholders at some point in their histories.” Still, earlier coerced labor systems in the Atlantic World generally differed, in terms of scale, legal status, and racial definitions, from the trans-Atlantic chattel slavery system that developed and shaped New World societies from the sixteenth to the nineteenth centuries. 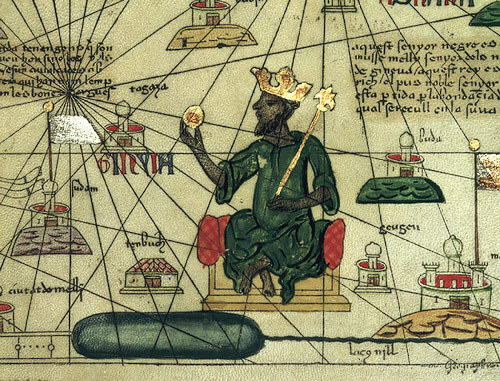 Mansa Musa in Catalan Atlas, drawn by Abraham Cresques of Mallorca, 1375, courtesy of the British Library. Mansa Musa was the African ruler of the Mali Empire in the 14th century. When Mansa Musa, a Muslim, took a pilgrimage to Mecca in 1324 he reportedly brought a procession of 60,000 men and 12,000 slaves. Slavery was prevalent in many West and Central African societies before and during the trans-Atlantic slave trade. 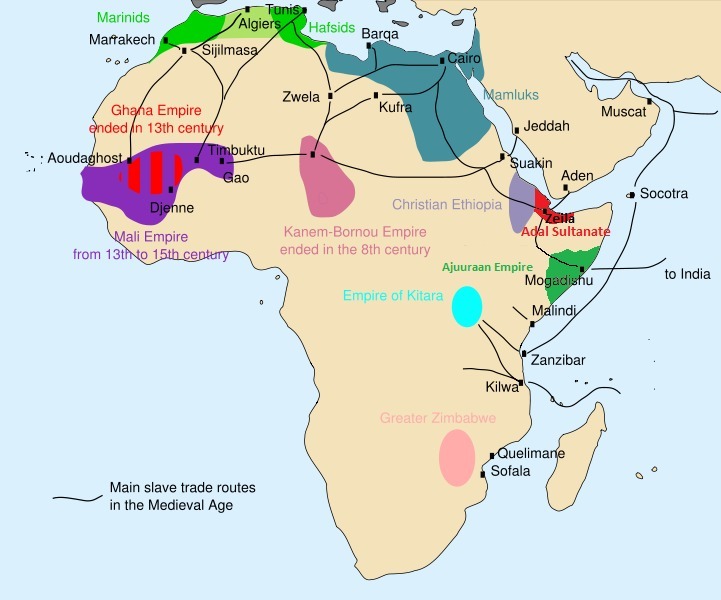 When diverse African empires, small to medium-sized nations, or kinship groups came into conflict for various political and economic reasons, individuals from one African group regularly enslaved captives from another group because they viewed them as outsiders. The rulers of these slaveholding societies could then exert power over these captives as prisoners of war for labor needs, to expand their kinship group or nation, influence and disseminate spiritual beliefs, or potentially to trade for economic gain. Though shared African ethnic identities such as Yoruba or Mandinka may have been influential in this context, the concept of a unified black racial identity, or of individual freedoms and labor rights, were not yet meaningful. Map of Main slave trade routes in Medieval Africa before the development of the trans-Atlantic slave trade, 2012. West and Central African elites and royalty from slaveholding societies even relied on their kinship group, ranging from family members to slaves, to secure and maintain their wealth and status. By controlling the rights of their kinship group, western and central African elites owned the products of their labor. In contrast, before the trans-Atlantic trade, western European elites focused on owning land as private property to secure their wealth. These elites held rights to the products produced on their land through various labor systems, rather than owning the laborers as chattel property. In contrast, land in rural western and central African regions (outside of densely populated or riverine areas) was often open to cultivation, rather than divided into individual landholdings, so controlling labor was a greater priority. The end result in both regional systems was that elites controlled the profits generated from products cultivated through laborers and land. The different emphasis on what or whom they owned to guarantee rights over these profits shaped the role of slavery in these regions before the trans-Atlantic trade. Scholars also argue that West Africa featured several politically decentralized, or stateless, societies. In such societies the village, or a confederation of villages, was the largest political unit. A range of positions of authority existed within these villages, but no one person or group claimed the positions of ruler or monarchy. According to historian Walter Hawthorne, in this context, government worked through group consensus. In addition, many of these small-scale, decentralized societies rejected slaveholding. As the trans-Atlantic slave trade with Europeans expanded from the sixteenth to nineteenth centuries, however, both non-slaveholding and slaveholding West and Central African societies experienced the pressures of greater demand for enslaved labor. In contrast to the chattel slavery that later developed in the New World, an enslaved person in West and Central Africa lived within a more flexible kinship group system. Anyone considered a slave in this region before the trans-Atlantic trade had a greater chance of becoming free within a lifetime; legal rights were generally not defined by racial categories; and an enslaved person was not always permanently separated from biological family networks or familiar home landscapes. The rise of plantation agriculture as central to Atlantic World economies from the sixteenth to nineteenth centuries led to a generally more extreme system of chattel slavery. in this system, human beings became movable commodities bought and sold in mass numbers across significant geographic distances, and their status could be shaped by concepts of racial inferirority and passed on to their desendants. New World plantations also generally required greater levels of exertion than earlier labor systems, so that slaveholders could produce a profit within competitive trans-Atlantic markets. Pyramid ruins in Yaxzhilan, an ancient Mayan city in Chiapas, Mexico, 2005. 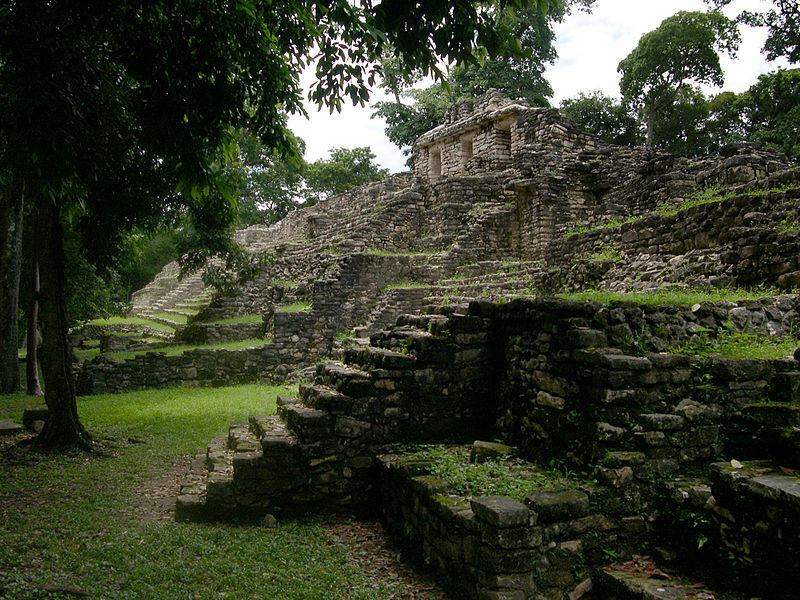 Maya was a hierarchical Mesoamerican civilization established ca. 1500-2000 BC. The Mayan social hierarchy included captive or tribute laborers who helped build structures such as pyramids. In the centuries before the arrival of European explorers, diverse American Indian groups lived in a wide range of social structures. Many of these socio-political structures included different forms of slavery or coerced labor, based on enslaving prisoners of war between conflicting groups, enforcing slavery within the class hierarchy of an empire, or forced tribute payments of goods or labor to demonstrate submission to a leader. However, like West and Central African slavery, American Indian slavery generally functioned within a more fluid kinship system in contrast to what later developed in the New World. Ultimately, the practice of slavery as an oppressive and exploitative labor system was prevalent in both Western Africa and the Americas long before the influence of Europeans. Still, the factors that defined the social, political, and economic purposes and scale of slavery significantly changed, expanded, and intensified with the rise of the trans-Atlantic slave trade and American plantation agriculture launched by European expansion. For these reasons, African and American Indian slavery before the trans-Atlantic trade differed significantly from the chattel slavery systems that would later develop in the Atlantic World. 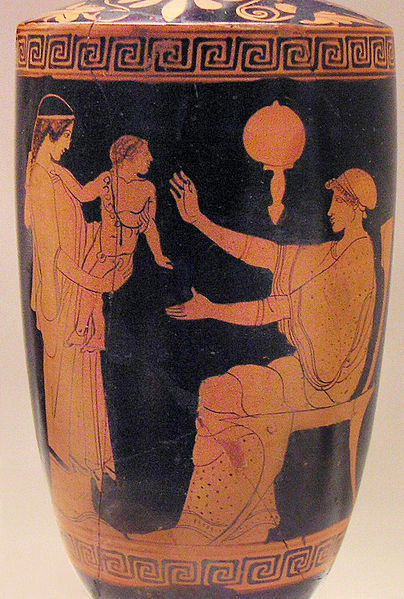 Greek slave presenting infant to its mother, vase, Eretria, Ancient Greece, 470-460 B.C., courtesy of the National Archaeological Museum. Serfs in feudal England, on a calendar page for August, Queen Mary's Psalter, ca. 1310, courtesy of the British Library Manuscripts Online Catalogue. In contrast to other Atlantic World regions, slavery was not prevalent in Western Europe in the centuries before the trans-Atlantic slave trade. Instead, labor contracts, convict labor, and serfdom prevailed. This had not always been the case. During the Roman Empire and into the early Middle Ages, enslaved Europeans could be found in every region of this subcontinent. After the Roman Empire collapsed (starting in 400 A.D. in northern Europe), the practice of individual Europeans owning other Europeans as chattel property began to decline. As described in the following sections, this decline occurred due to unique religious, geographic, and political circumstances in Western Europe. By 1200, chattel slavery had all but disappeared from northwestern Europe. Southern Europeans along the Mediterranean coast continued to purchase slaves from various parts of Eastern Europe, Asia, the Middle East, and Africa. In Lisbon, for example, African slaves comprised one tenth of the population in the 1460s. Overall, however, the slave trade into southern Europe was relatively small compared to what later developed in the New World. After the fall of the Roman Empire, western European elites began to focus on acquiring and controlling land, and the goods produced on the land they owned, rather than controlling laborers through slavery to accumulate goods. The European labor systems that began to replace slavery should not be confused with modern free labor, but serfdom, convict labor, and contract systems did grant workers access to rights that were denied to slaves. 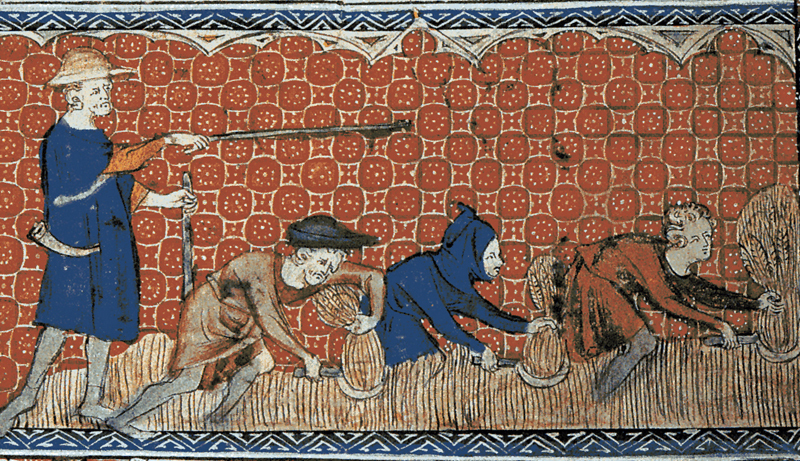 For example, European serfs were bound to work for the lord of a manor, but in return the lord provided protection and land that serfs could farm for their own subsistence. While serfs did not own the land they worked, they could not be sold away from it like chattel slaves. Instead, serfs were bound to whichever lord currently owned the manor. By the fourteenth and fifteenth centuries, serfdom declined in Western Europe due to population changes and economic shifts resulting from the Black Death. Hiring contract laborers became more profitable for landowners in Western Europe and as a result, European laborers gained greater control over their own labor and mobility.